Many of you now know that Dr. Stein's beautiful wife, Joyce, is waiting for a double lung transplant. She was officially placed on the registry at UCLA shortly before Christmas 2018 and, we were given the great news that there was only one person in front of her waiting to get lungs! With this placement on the list, the doctors at UCLA have estimated that it would take 2-3 months for her to receive the call that they have a new set a lungs of her. One month has now passed since she was placed on the registry and, with every day that passes, our anticipation grows greater and greater for the call that is going to change everything. For Joyce, a new set of lungs will bring a lot of change. It will give her a greater quality of life. For the last several years, she has had to rely heavily on an electric scooter and portable oxygen tank but, she is looking forward to the day when she can run and play with her beloved grandchildren, push a shopping cart through a grocery store, and even clean her house! This journey has been a tough one but, we have all been inspired by Joyce and her will to live and to live well in spite of her circumstances. She loves dearly, laughs often, and enjoys every minute with her friends her family. 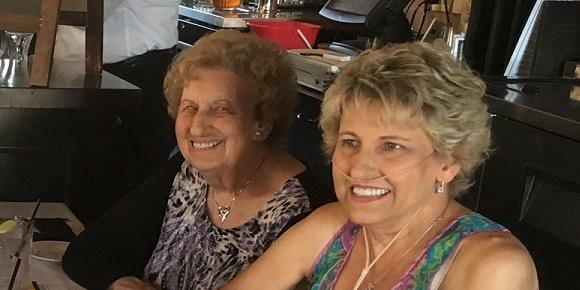 She truly is a joy to be around and, for all of us who are hoping and praying for her, there is no one more deserving of a miracle than Joyce. While the waiting is never easy, we have been completely blown away by the outpouring of love, support, and well-wishes received from our patients, family, and friends. From Facebook posts to handwritten cards and verbal affirmations, we have all felt so much love! Dr. Stein and Joyce have both been truly touched. They are grateful to be surrounded by staff and patients who have elevated themselves to be more like family and friends. It is comforting to know that, when the call comes, our patients will be understanding and our staff will rally together to "hold down the fort" and provide the best care for our patients! Thank you to all of you who have written, prayed, and lent your support! We are truly blessed. *Many patients have requested updates on Joyce's journey to a lung transplant, Please rest assured that any updates received will be posted as soon as possible! Thank you for your concern!